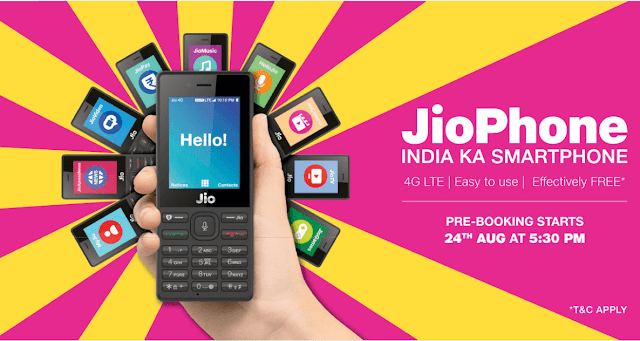 Reliance Jio will start the pre-bookings of the Jio 4G feature phone on 24 August 2017, 5.30pm. The Jio Phone will be available for free but customers have to pay Rs 1500 refundable amount at the time of booking. The amount will be refunded after 3 years. The Jio 4G feature phone pre-booking of Reliance Jio Phone will start for Rs 500 across Reliance Jio Infocomm Ltd’s retail stores, the website and the Jio App from 5pm on Thursday, JioPhone would always be free and they would get unlimited data for a month against payment of Rs 153. 4-Pay the amount Expected Rs.500 And Remaining Rs. 1,000 Pay later while Delivery/picking up the handset. Customers can visit authorised Reliance Jio retailer outlets such as Reliance Digital stores. Once the customer has furnished the Aadhaar details, he will be assigned a token number, which is necessary at the time of delivery of the phone. 1- Open the MyJio App on your phone. 2- Click on the Jio Phone Pre-Booking option. 4-Proceed to pay the amount and book the phone. 5- You will have successfully booked your Jio Phone.